Lake of the Woods County, east of Roseau County on Minnesota Highway 11, has the second smallest population in the state (4,045). But, every summer, it gets much more crowded because of all the people fishing on . . . Lake of the Woods. Lake of the Woods is huge, spreading across Minnesota, Manitoba, and Ontario. It’s the sixth-largest freshwater lake located (at least partially) in the United States, after the five Great Lakes. It has a wide variety of fish, but is best known for its walleye. The county seat of Baudette (pop. 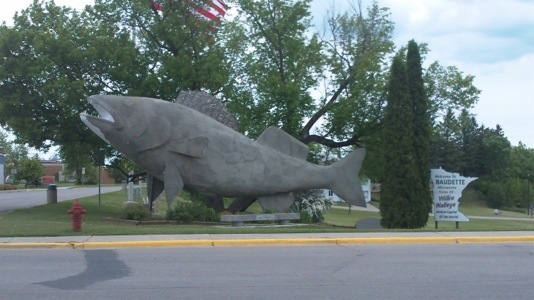 1,106), is known as The Walleye Capital of the World. 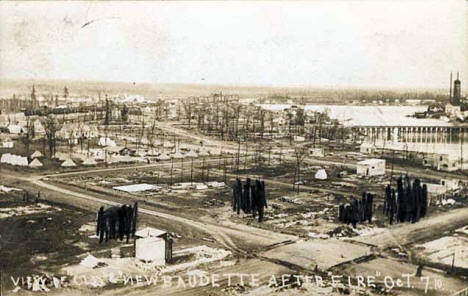 Baudette and other towns in the area were rebuilt after a disastrous 300,000-acre forest fire in 1910. Lake of the Woods County is the northernmost county in the United States. There are two main reasons for this: 1) Alaska has no counties and 2) Lake of the Woods County has the Northwest Angle, which extends north into Canada. Before Alaska was a state, this was the most northerly place in the U.S. The Northwest Angle (pop. 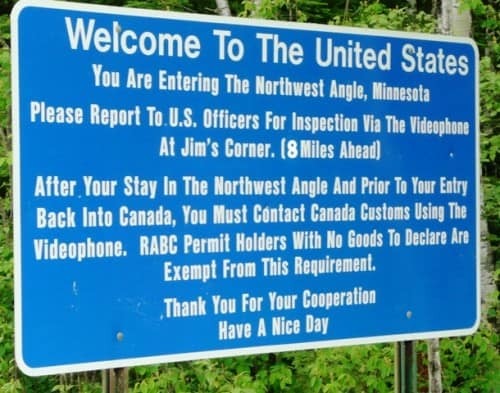 152) goes about 27 miles north of the 49th Parallel, which is the U.S.-Canadian border from northwestern Minnesota through North Dakota, Montana, Idaho, and Washington. The Angle was a result of confusion about the location of the source of the Mississippi River at the time of the Treaty of Paris (1783). The Northwest Angle is not connected by land to the rest of Minnesota. 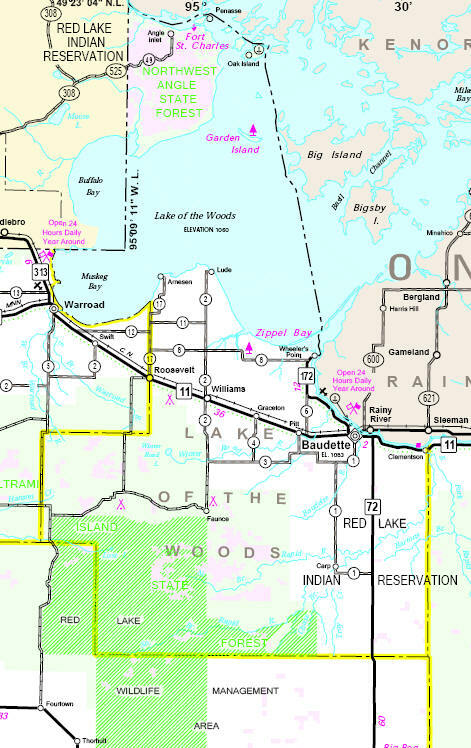 To reach its many fishing resorts, drivers must go through a section of Canada. Northwest of Baudette, Zippel Bay State Park has white sand beaches for summer swimming in Lake of the Woods, as well as fishing, hiking, camping, and winter cross-country skiing. For 85 miles east of Lake of the Woods, the Minnesota-Canada border is the Rainy River, which begins in Rainy Lake (in Koochiching County) and ends in Lake of the Woods. Baudette is across the Rainy River from the town of Rainy River, Ontario. 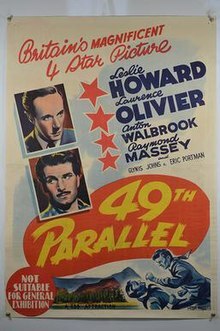 This entry was posted in Minnesota and tagged 49th Parallel, Baudette, Lake of the Woods, Lake of the Woods County, Northwest Angle, Rainy River, Willie the Walleye. I was always curious about that little inlet into Canada. Keep up the good blogging! Fun to wake up and read something interesting about my birth state over coffee each morning. Especially these days as we never got any farther north than the Twin Cities. Saw the reservation – what’s the Native American population?